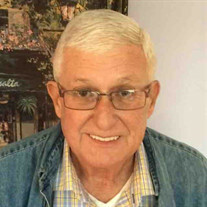 Jimmy Dean Baynard, age 71, of Rutherfordton, NC, died Monday, September 12, 2016, at Spartanburg Regional Medical Center in Spartanburg, SC. He was the son of the late John William Baynard and Pauline Scoggins Baynard and a native of Rutherford County. Jimmy was a member of Southern Baptist Church. He loved his family, friends, faith, football and NASCAR. He was preceded in death by one son Little Jim Baynard and one brother Bill Baynard. He is survived by his wife: Nancy Kathleen Baynard. Janie Lynn Murray of Sunshine. The family will receive friends from 5:00 PM to 7:00 PM, Wednesday, September 14, 2016 at McMahan's Funeral Home. The Funeral service will be at Southern Baptist Church at 1:00 PM, Thursday, September 15, 2016 with Reverend John Perry officiating. Interment will be at Southern Baptist Church Cemetery. In lieu of flowers memorials may be made to Southern Baptist Church; 140 Church Street; Rutherfordton NC 28139. Online guest register/tribute wall at www.mcmahansfuneralhome.com. McMahan's Funeral Home & Cremation Services in charge of arrangements.